More than pizza or burgers, chicken wings hold a special place in the hearts of Minneapolis sports fans. Ordering up a piping-hot basket of wings while you sip on a cool drink in the glow of a big screen is what the good life is made of. But while all can agree that wings are the perfect pre-, mid-, and post-game snack, what makes for good chicken wings—and, therefore, where to find the best—is certainly up for debate. Are wings better with dry rub or sauce? Do you measure based on spice blend or spiciness? And what about texture? Should wings be crunchy or tender—or must they be both? Reasonable people can disagree on what constitutes the perfect chicken wing. 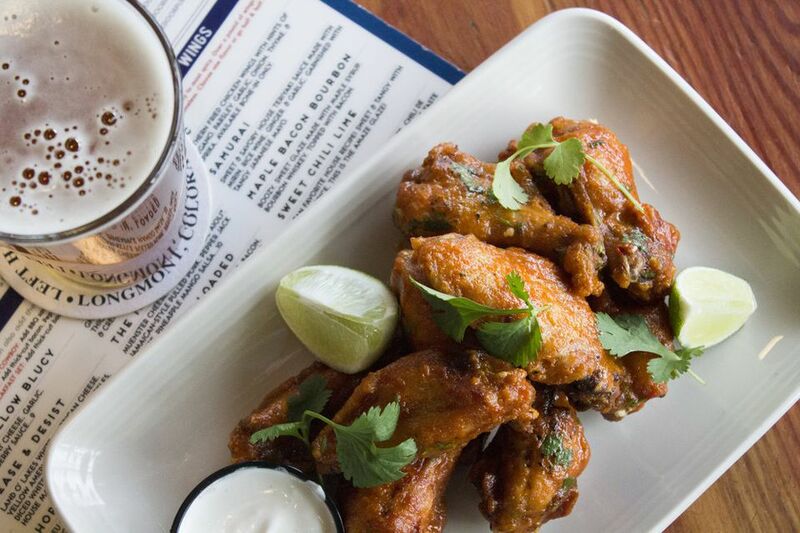 But regardless of where you fall, these three Minneapolis eateries are undoubtedly home to some of the best, finger-licking wings in the city. As one of the best sports bars in Minneapolis, it's only natural that the Blue Door Pub would top this list, too. The restaurant offers nearly a dozen wing varieties, ranging from mild and crunchy to tongue-meltingly spicy—with tons of fun flavors on the spectrum in between. In addition to the traditional buffalo sauce, the menu features a sweet chili lime sauce, a habanero-peanut sauce combo, and crowd favorite: a sweet, smokey maple bacon bourbon sauce. Made with actual maple syrup and real bourbon whiskey, these wings are sticky and sweet with a slight boozy kick. Fill up on a heaping basket of wings, or share and pair with some of the restaurant's signature sides. In addition to the standard pub fare of tater tots, onion rings, and cheese curds, the menu also boasts such delicacies as duck wontons, deep-fried green beans, and gooey/crunchy Spam bites (you read that right). Tip: Order a side of tater tots and ask for them to be tossed in your favorite wing sauce. You're welcome. For some of the best no-fuss, traditional buffalo wings in the city, you really can't go wrong with Runyon's in the North Loop. Unlike a lot of other wing joints, this spot only has one sauce available for its wings—but the one sauce is really all you need. Runyon's has been perfecting its recipe for more than three decades, and it doesn't disappoint. Vinegary with just a bit of a mild kick, the wings are coated in enough sauce to balance the flavors, but not so much that the chicken is swimming in them. Baskets can be ordered in regular, double, or party size portions and all come with some celery and a creamy, homemade bleu cheese dipping sauce that has real chunks of bleu cheese inside. The dish's minimalism is part of its appeal: It's everything you need from chicken wings, and nothing you don't. The pub also features an impressive beer and liquor selection, and its proximity to many of Minneapolis' best entertainment and cultural venues such as Target Field, the Guthrie Theater, and First Avenue make it a great place to ramp up or wind down an epic evening. Tip: Because Runyon's is near downtown, finding parking can be a challenge. Skip the headache altogether by opting to take the light rail instead. The pub is located within a 10-minute walk from the Target Field Station, where you can easily hop on either METRO's Blue or Green train lines to head southeast toward the Mall of America or Union Depot, respectively. Opened in 1906, the Monte Carlo is one of the oldest eateries in Minneapolis. The menu features a ton of seafood, so it's interesting this spot would also have some of the best wings in the city. The chicken at the Monte Carlo is tossed and fried with a rich mix of Asian spices. They're straight-up dry rub wings, so no sauce here, but with interesting flavors such as cinnamon and orange, you don't really miss it. Just don't ask for ranch dressing with your wings. You won't get it. In addition to the full food menu, the restaurant has a lengthy wine and cocktail list, as well as a host of adult malts and floats that are perfect for dessert. If you're feeling a bit nostalgic, try the Dreamsicle Float. The drink is made with orange soda and vanilla ice cream that will take you back to those summer afternoons, sitting on a curb eating a frozen treat from the ice cream truck. It's capped off with a splash of vodka, just in case you needed a reminder you're an adult now. Tip: When the weather is nice, grab a seat out on the patio. The brick-floored outdoor area has comfy chairs and round tables covered with umbrellas for shade.